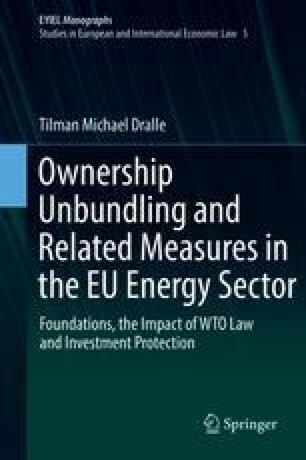 So far the focus has been on the question of whether and to what extent WTO law and international investment law prohibit or limit the implementation of unbundling and unbundling-related measures in the EU energy sector. It was this perspective that guided the analysis in Chaps. 4 and 5. In contrast, this chapter will sketch the ‘positive’ role that WTO law could play in the formulation of unbundling policies at both the national and supra-national levels. In other words, this chapter considers how the existing general WTO framework deals with the anti-competitive practices flowing from vertical integration and to what extent it imposes a positive obligation upon Members to bring about some degree of vertical separation in the energy sector. In addition, it will be shown how the existing WTO disciplines could be complemented by additional pro-competitive regulatory commitments, including in particular common rules on unbundling of energy companies.